During the full glacial period (17,000 - 14,500 B.C.) before Paleo-Indians arrived, the Piedmont had been a boreal forest. As temperatures warmed conifers were replaced by deciduous forests (oak, hickory, walnut, elm, willow, and sugar maple by 10,500 BC. Continued warming brought new forests of sweet gum, chestnut, red maple, and tupelo gum by 7000 B.C. When Paleo-Indians first came into the Piedmont winters were harsher and summers cooler than today. For about 1000 years, both people and now-extinct Pleistocene animals co-existed in North Carolina. 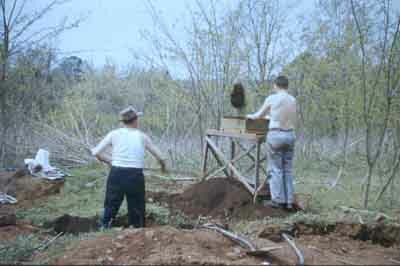 View of excavations at the Hardaway site in 1956 (courtesy of the Research Laboratories of Archaeology). Hardaway is the most recognizable site name in North Carolina. Most stone tools found in the Piedmont are made from a fine-grained rhyolite that outcrops in the Uwharrie Mountains. Excavations at the Hardaway site in Stanly County have yielded tons of rhyolite tools and chipping debris dating to the Late Paleo-Indian and Early Archaic periods. 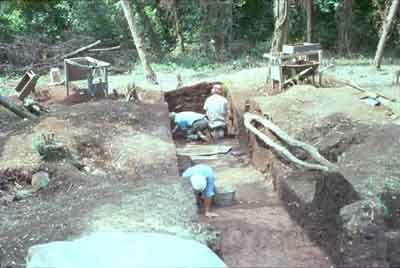 The site was first recognized as important in the 1930s and excavations began after World War II. View of excavations at the Hardaway site in 1975 (courtesy of the Research Laboratories of Archaeology). 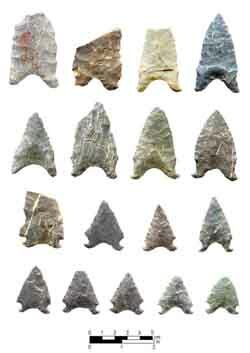 The oldest component at Hardaway was represented by Hardaway-Dalton points, Hardaway Side Notched, and Hardaway Blades, which date from 8500 to 7900 B.C. 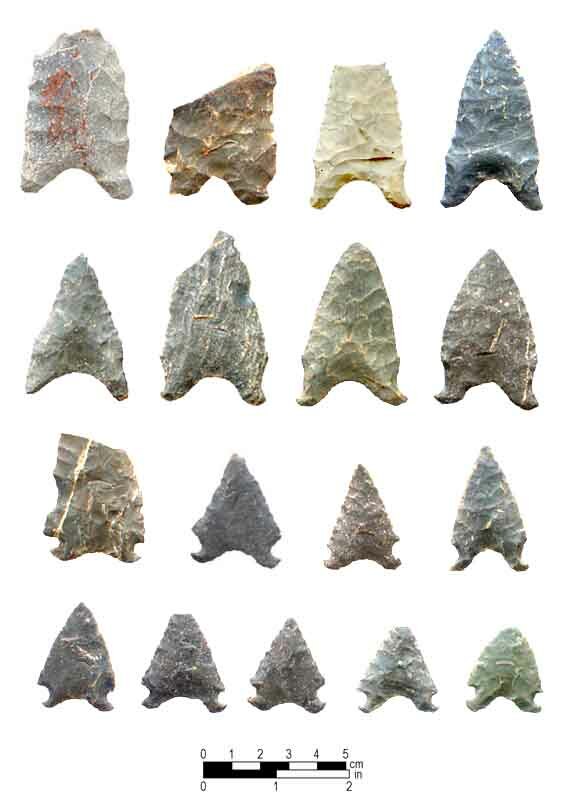 Hardaway Blade (top row, left two specimens), Hardaway-Dalton (top row, right two specimens and second row), and Hardaway Side-Notched (bottom two rows) spear points from the Hardaway site. 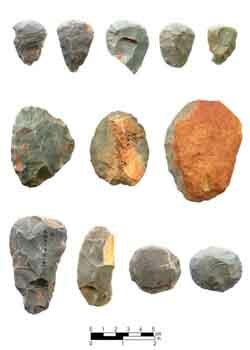 Other stone tools associated with the Hardaway complex, such as unifactial end scrapers and side scrapers, are very similar to those used by Paleo-Indians. Chipped-stone tools from Late Paleo-Indian and Early Archaic contexts at the Hardaway site: end scrapers (top row), side scrapers (middle row and bottom row, second from left), oval scrapers (bottom row, right two specimens), and Dalton adz (bottom row, far left). In the Piedmont, roaming bands of hunter/gatherer Paleo-Indians probably enjoyed a wealth of natural resources that were exploited seasonally.